TRUE DEGREES angle measurement system is a wireless, digital angle measurement device that attaches to your bending machine. It provides a continuous readout of the achieved bend angle during bending operations. TRUE DEGREES eliminates climbing on the pipe. The bending operator monitors each push without leaving his station, thus saving the time normally requires for manual measurements and calculation. The system consists of two measurement units and a master receiver unit with a digital readout. The magnetic mounts used in the measurement units allow very fast setup on all pipe sizes. The display shows angles of both end and the net bend in the pipe. Box Dimensions: 14” x 6” x 18” Weight: 23 lbs. 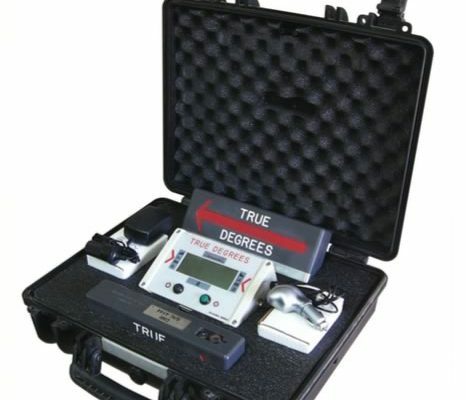 Note: Each True Degrees System is a matched set and consists of one receiver, one left transmitter and one right transmitter. Mismatched units will not communicate with each other. These have a designed range of 100ft (30m). This will not interfere with other devices outside this range. It is advisable to consult your local laws and regulations and inform DMI International, Inc. if any special frequencies are required. If no indication is given, the units will be supplied for use with the frequency of cordless telephones in the country of destination.